The tool is free to use if you have access to Microsoft Excel. Just download the spreadsheet. 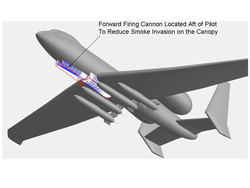 This report will detail the conceptual design and sizing of a Close Air Support (CAS) vehicle to full fill AE 6343 Fall 2007 Project 1, based on 2006-2007 AIAA Graduate Design Competition RFP . 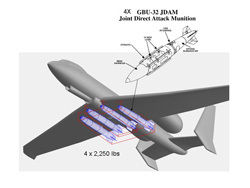 The primary goal of this vehicle is to replace the aging yet invaluable A-10 Thunderbolt II, with a faster, higher range capable aircraft. 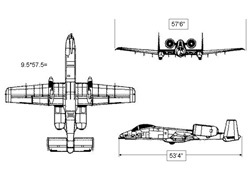 In addition to replacement of the A-10’s, the role of this new air vehicle will be to bridge the gap between the A-10 (CAS vehicle) and the F-16/F/18 (pure fighter vehicle), hence the name Super Close Air Support (SCAS). 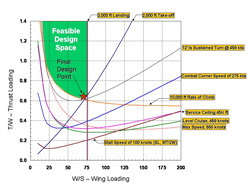 To facilitate the conceptual design and analysis of this aircraft a spreadsheet Fixed Wing Design (FWD) tool was created using an energy based approach for aircraft design. 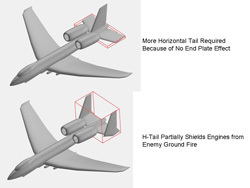 This method, outlined in AE 6343 class, Mattingly , and Roskam  is the basis of this report. 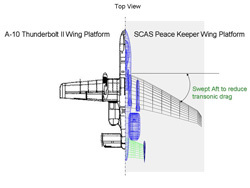 The reader of this report, armed with the FWD tool, Mattingly, and Roskam, should be capable of repeating the conceptual design of this SCAS vehicle outlined in this report or any other fixed wing aircraft. 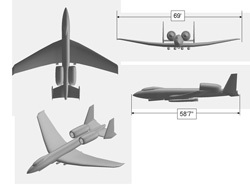 The initially found design solution SCAS vehicle named “Freedom Fighter” is compared to the current A-10 Thunderbolt II in Table 1, and accompanying 3-views are shown in Figure 1, and Figure 2.